Lovecraft’s correspondents were scattered all over the country, and he found it engaging to be in touch with individuals from those areas of the United States where he had never been. Letters to two correspondents from the Pacific Northwest, Duane W. Rimel and F. Lee Baldwin, fill the bulk of this volume, and they reveal Lovecraft’s customary role of tutor and mentor to young devotees of weird fiction in the 1930s. As a novice writer of weird fiction, Rimel came in touch with Lovecraft to seek assistance on improving his work and getting it published in pulp or fan magazines. In the course of their relationship, Lovecraft helped Rimel on as many as three stories—“The Sorcery of Alphar,” “The Tree on the Hill,” and “The Disinterment.” He gave Rimel valuable advice on the technique of writing weird fiction. Baldwin was a fan of weird fiction who assisted in the establishment of the first fantasy fanzine, the Fantasy Fan. Later he wrote one of the earliest biographical articles on Lovecraft (with a linoleum cut of Lovecraft by Rimel). Lovecraft wrote extensively to Baldwin about his writing, his attempts at drawing, and other matters that illuminate many aspects of his life and work. A third correspondent in this volume, Nils Frome, was a Canadian fan of weird and science fiction whom Lovecraft instructed on matters ranging from astronomy to occultism. As in all previous volumes in the Collected Letters series, these letters have been meticulously edited by David E. Schultz and S.T. Joshi, two of the leading authorities on Lovecraft. Included as well are many rare and pertinent writings by the various correspondents, which shed light on their relationship to Lovecraft. An extensive bibliography and a comprehensive index conclude the volume. H.P. 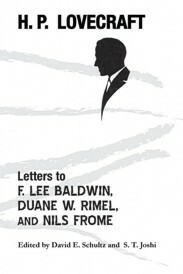 Lovecraft: Letters to F. Lee Baldwin, Duane W. Rimel, and Nils Frome.. By H.P. Lovecraft, Edited by David E. Schultz and S.T. Joshi. New York, NY: Hippocampus Press; 2016; ISBN 978-1-61498-157-2; paperback, 444 pages.